22 global cities, including London, Barcelona, Paris, Mexico City, Rio de Janeiro, Lagos and Fukuoka have announced the 23 innovative solutions they selected to solve their most pressing urban and social challenges. In a unique global effort, these 22 forward-thinking cities opened their challenges to innovators worldwide via the LLGA | Cities Pilot the Future Programme. Out of 2,500 candidates, a total of 456 solutions competed for the opportunity to implement their solution in real-life, responding to challenges in areas such as as social exclusion, energy management, urban dereliction, tourism, ageing and health. Each of the 23 winning solutions announced during the LLGA | Cities Summit in San Francisco have committed to co-invest in the participating cities to help improve the lives of 121 million citizens. In the first LLGA | Cities Summit held in a North American City, public leaders from 22 global cities revealed the innovative solutions that best meet strategic challenges in a variety of fields like Making outside Seating Areas More Sustainable in Paris; a Storm Response Coordinating Tool for San Francisco; a Transformational lighting System in post-earthquake Christchurch (New Zealand); Digital Tools For Better Healthier Ageing in Mexico City; Sustainable Urban Mobility in Maringá (Brasil); and Regenerating Neighbourhoods Using Vacant Spaces in Barcelona. The coming 12 months will see the cities and solution providers join forces to implement the innovations that will help improve the quality of lives of citizens and shape the future of their cities. On 14 May 2013, leaders of the 22 partner cities and the 120 nominated solution providers came together at the LLGA | Cities Summit in San Francisco to deepen their partnerships, announce the 23 most promising solutions, debate their challenges, and kick-start implementation. The LLGA winners reflect the many approaches available to solve cities’ problems ranging from the technological to the social. For example, on the technological side, OTG Playa answers Lagos’ need to bring digital connectivity in bandwidth-challenged environments. OTG Playa proposes to deploy a network of boxes, which will broadcast a wireless internet cloud that is open and free to anyone in the area. This solution shows how civic technology businesses can help solve some of the most urgent global needs even in areas with limited urban services and infrastructures. On the other hand, 3Space, winner for Barcelona, is an innovative charity which unlocks the potential of empty commercial property by making it available for temporary community use. This responds, in a non-technological way, to the widely experienced problem in many cities of urban decay and dereliction. The participation of cities and solution providers in LLGA | Cities Pilot the Future is a joint commitment to spread proven innovations in a more cost-effective and sustainable way, helping build more resilient and smarter communities. 557,000 local governments spend $4.5 trillion each year to deliver the services that shape the quality of life of the majority of the world’s population. The LLGA initiative helps cities discover innovative, yet ready solutions to meet their problems and matches their commitment to act with the willingness of businesses and organisations to share early risks. Past editions of LLGA have proven that this process can deliver solutions to citizens at least 3 times faster and at 80% lower costs by leveraging smart solutions and avoiding re-invention. Next to the 22 Partner Cities, LLGA | Cities Pilot the Future is supported by a global group of strategic partners including the City of San Francisco, Oracle, The Climate Group, and the UN Global Compact Cities Programme. Europe, Africa, Asia and the Americas. Its mission is to accelerate the sharing of solutions for cities by matching social and urban challenges early-on with ready solutions around the world. In the past four years Citymart.com has published 70 Calls for Solutions. Oracle’s City Platform solutions leverage the company’s best-in-class portfolio of products to address complex business processes relevant to the public sector, helping speed time to market, reduce costs and gain a competitive edge. The Climate Group is an independent, not-for-profit organization, which brings together a global coalition of the world’s most powerful governments, brands and public figures across Asia, Europe and North America. Since 2004, they’ve been working with governments, business leaders and the world’s most influential individuals to push for the policies, technologies and investment we need to make the Clean Revolution commercially viable. Together, we have the power to create a smarter, better, more prosperous future for all. The UN Global Compact Cities Programme was initiated by former UN Secretary General, Kofi Annan in 2003. It is a discrete component of the Global Compact, based in Melbourne and New York. The UN Global Compact Cities Programme provides an innovative framework for cities to develop and implement sustainable solutions to urban challenges of a long-term and often intractable nature. It was developed in response to the need to rethink sustainability approaches and to enable meaningful engagement of cities across all their activities—economic, ecological, political and cultural. By utilizing a common methodology, ‘Circles of Sustainability’, UN Global Compact Cities Programme combines the knowledge, experience and resources inherent within municipalities, business and civil society to bring together the strengths of each. With increasing social demands and decreasing resources to respond to them, social innovation is much more than a buzzword in Barcelona. Over the last 12 months, UpSocial has been working in partnership with the City of Barcelona and Citymart.com to (a) identify the best proven innovations capable of responding more effectively or efficiently to critical social problems; and (b) facilitate their successful implementation locally. Social innovation does not circulate as quickly and nimbly as market-led innovation. The incentives seem to be missing. This is why social innovation (defined as a novel solution to a social problem that is more effective, efficient, sustainable, or just than existing solutions and for which the value created accrues primarily to society as a whole) rarely surpasses the borders of the initial project. “Nearly every problem has been solved by someone, somewhere. The challenge of the 21st Century is to find out what works and scale it up”, said Bill Clinton. With this idea in mind, and inspired by the work of Ashoka’s ChangeNation in Ireland, UpSocial designed a methodology to respond to critical social challenges through the best proven innovations. Citymart.com played a key role in its design and in researching solutions. Actually, UpSocial used its platform to discover innovations and engage a multisectorial jury to evaluate them and select the most appropriate. This initiative, titled Social Innovation for Communities (SIC), started with the City of Barcelona and the government of Catalonia identifying four social challenges that required innovation: (a) short and long term solutions for youth unemployment; (b) opportunities for single-parented families in risk of social exclusion; (c) increasing the employability of people with disabilities; and (d) improving the environmental impact of mass tourism in Barcelona. A call for solutions was issued through CityMart and over 400 solutions were initially identified in 8 weeks. Evidence of impact: The existence of evidence of impact to make sure the innovation has been successfully implemented. Scale: scale of implementation of the innovation, to understand whether it has been packaged in a way that replication is feasible. Income: The sustainability model is consolidated, so that the model can be implemented efficiently. Low barriers to entry: no major obstacles are found for implementation, such as major investment needs or legal reforms. The jury of each challenge selected 3 to 5 innovations and the winning innovators were invited to Barcelona to meet with potential investors, replicators, and key stakeholders interested in replicating/implementing their model. Public events were also organised to present the innovations and generate debate about current practices implemented to resolve social problems. It is early to make a proper evaluation of the impact this whole process has had to date. Impact will be measured against the outcomes generated by the new solutions implemented. However, an indicator provides with a promising result: of the 12 innovations brought to Barcelona, 6 are currently being implemented and 3 are negotiating partnerships to adapt their model locally. The development of a better ecosystem for social innovation is also emerging as a positive outcome. Social innovators have appreciated the value of being confronted with different expansion models and the support they received in designing a light but effective outreach strategy to international expansion. Social R&D must be a top priority: as social needs increase and become more complex, the potential results of investing in R&D become more evident. This means researching sustainability models to resolve social problems, reviewing the means and goals, bringing together problems and challenges to find disruptive solutions, etc. Importing social innovation requires the participation of the innovator to capture the learnings, accelerate implementation and increase the possibilities of success, as well as the engagement of local actors capable of adapting and replicating the innovation. The two parts are necessary. Social entrepreneurs and social enterprises do not usually have consolidated and well-defined expansion and replication models. There is a need to support successful social entrepreneurs in designing efficient models, usually requiring little support from “headquarters”. There is a great potential in finding new business models to resolve social problems. There are also very interesting innovations in management that allow traditionally small-scale solutions to reach out much larger groups. Citymart.com is an efficient and effective marketplace for innovation, and it works also with social innovation. Its transparent process, the capacity to identify solutions globally and the way it manages knowledge and information is extremely valuable. For further details on UpSocial and this process, visit Citymart.com/call/SICBarcelona. 120 global companies and organizations have pledged their commitment to implementing their high impact solutions to challenges such as social exclusion, energy management, urban dereliction, mobility and health. In a unique global effort 22 forward-thinking cities including London, Barcelona, Paris, Mexico City, Rio de Janeiro, Lagos and Fukuoka opened a competition for innovators to win the opportunity to implement their solutions in a real environment. After a selection process covering 2,535 candidates, 120 providers were invited to present their commitment to partner with cities and help improve the lives of 121 million citizens. In November 2012 the fourth edition of LLGA | Cities Pilot the Future programme was launched by Citymart.com in partnership with Oracle, the UN Global Compact Cities Programme and The Climate Group. In this one-of-a-kind initiative 22 cities publicly published their most pressing urban and social challenges in areas such as social inclusion, health & well-being, economic development, urban management, mobility, lighting, energy and sustainable lifestyles. Over a 3-month period, Citymart.com researchers identified 2,535 solutions that responded to those challenges. A total of 456 solutions entered a first round of evaluation with the help of 159 expert jurors chosen by the cities. The full list of nominees can be seen here. Entering the second and final round in the program, 120 companies and organisations of different sizes, such as The Good Life for All, a social enterprise from Brighton (UK), Virtualwaregroup an SME based in Bilbao, Mobcoders, a Danish start-up or Philips, have committed to presenting proposals to invest in the participating cities to demonstrate the viability and impact of their technologies and solutions in real life. The participation of cities and solution providers in LLGA | Cities Pilot the Future represents a joint commitment to spread proven innovations in a more cost-effective and sustainable way, helping build more resilient and smarter communities. 557,000 local governments spend $4.5 trillion each year to deliver the services that shape the quality of life of the majority of the world’s population. The LLGA initiative helps cities discover innovative, yet ready solutions to meet their problems and matches their commitment to act with the willingness of businesses and organisations to share initial risks. Past editions of LLGA have proven that this process can deliver solutions to citizens at least 3 times faster and at 80% lower costs by leveraging smart solutions and avoiding re-invention. On 14-16 May 2013, leaders of the 22 partner cities and the 120 nominated solution providers will come together at the LLGA | Cities Summit in San Francisco to deepen their partnerships, announce the 22 most promising solutions, debate their challenges, and kick-start implementation. Congratulations to all LLGA2013 nominees! Blog by Kirsten Jack, Acting Head of Smart Technologies, The Climate Group. In this post I take a look at solutions to promote economic development. LLGA has a strong history of tackling economic development challenges, and examples from past LLGA editions can be found in Lagos, Cape Town, Sant Cugat and Kristiansand. All these cities found — and are piloting — solutions through LLGA to promote economic development and growth. Growth is critical to ensure resilience of cities, and enable spending to guarantee city resilience and quality of life for its citizens. The capacity to innovate is a core element of competitiveness, and the introduction of innovative solutions is key therefore to both ensuring competitiveness, promoting a culture of innovation and so ensuring continued growth. The ability of large organizations to innovate towards a low carbon model is likely to be a key differentiator between those that thrive and those that fall behind in a ‘clean revolution’. The importance of economic development to city managers is also underscored in our recent AgileCities survey of 50 global cities. 70% respondents stated they saw economic development and jobs creation as a significant challenge in the next five years (on a par with the challenge of climate change), with smaller cities of around 200,000 citizens feeling particular challenged. In this year’s LLGA sets, there are two major challenges focusing on economic development. Lagos, Nigeria, is seeking solutions to deliver content seamlessly in bandwidth-challenged environments, to provide access to the social and economic benefits of Internet. The UN estimates that by 2015 Lagos will be the world’s third most populous city, with over 23 million citizens. But while hardwear is ever more accessible, the infrastructure gap becomes the major obstacle, with the level of penetration as low as 28% within Nigeria, ranking third in the world for sub-standard Internet speed. So, even when there is Internet coverage, it is often not capable of dealing with the faster, more inclusive and interactive services that are needed to allow citizens to access city services, and to utilize technology to support the families and businesses. The City of Lagos is therefore looking for a scalable city-wide Wi-Fi solution with the option of working in a disconnected mode, with an independent power source. Typically, these hotspots will be set up for various uses, such as content provision for schools, libraries and community centers. It is essential that the solution can work as a hotspot-content server for data storage, and can operate in a standalone mode. Tacoma, USA, is looking for tools to support economic and sustainability decision-making to secure return on its investments. The City of Tacoma was named one of the most polluted urban environments in North America in the early 1980s. Since then, the city has striven to clean up its environment and provide a model for sustainable living. As a result of this progressive environmental posture, it was recently designated the first city to be named a “Lifecycle Community” by the Institute for Environmental Research and Education. As part of this designation the city is adopting Life Cycle Assessment (LCA) practices, and the city’s Environmental Service Utilities (ESU) is therefore inviting solutions to develop a Sustainable Return on Investment tool, that can be used to evaluate and select the most sustainable solutions to the city’s infrastructure needs. The Nollywood Upgrade Project (Nollywood UP). Piracy is the biggest worldwide threat to the film industry, and has cost the industry a whopping US$18.2 billion. It is a threat not only to the western markets, but also those in developing regions such as Lagos, Nollywood. Recognized among the top three film-producing clusters in the world, Nollywood movies are cherished on the African continent as well as across the global diaspora, with many films reaching audiences of over 15 million viewers. Yet, video piracy affects 80-90% of distribution, severey limiting the economic benefits that the sector could bring to the city. So in 2011, Lagos set the challenge to reduce piracy and effectively monetize Nollywood and published a Call for Solutions in LLGA. The Nollywood Upgrade Project (Nollywood UP) finalist of LLGA2011, was officially launched in September 2012 by Nollywood Workshops in partnership with the Lagos State Government. The initiative will support the Nigerian Film Industry to withstand challenges presented by digital piracy. Its first phase will provide training, film financing and new distribution technologies to the cluster. In addition the winning solutions, Eggup.com is set to provide an online digitisation platform to support film distribution, placing Nollywood well on the road to sustainable economic growth. Finding hitherto unknown and fully committed solution providers. Launch of the Nollywood Upgrade Project as a partnership, including local and internationally committed stakeholders within just 12 months. Involving leading global institutions such as Harvard University. Combining training, film financing, and new distribution technologies into a single process. The LLGA program has also highlighted solutions to help Cape Town with its large unemployment figures through support and funding of innovative entrepreneurs via the Venture Capital Cultivator fund. Also in Cape Town, we find Cape GeniUS!, the winner of the 2012 edition. This project aims to tackle present and future challenges at strategic and operational levels in the city of Cape Town with the ‘Open Innovation’ process, which facilitates conversation between businesses and communities. Finally, two more LLGA challenges to mention include Sant Cugat‘s Local Innovation Plan, winner for the City of Eindhoven in 2010. This plan aims to introduce innovation as a basic element to accelerate sustainable development and economic competitiveness, and is designed through an innovative participative process. The second is City Direct by Innovation Center, the winners for Kristiansand in 2012. The Center provides a platform through which citizens can share ideas on budgets and priorities directly with city leaders, allowing the city to learn what its people want efficiency and effectively. To learn more about sustainable innovation in cities, read my previous posts on information products, sustainable mobility and energy efficiency. While the above is the last post in this short blog series, I’ll soon return with a series on how cities continue to innovate, sharing findings from our Agile Cities program. You can submit solutions for LLGA 2013 current challenges until January 31. LLGA has an history of tackling transport and movement challenges. Good examples include Santiago de Chile, Lavasa (India) and Barcelona, three cities that both found — and are piloting — solutions to improve the effectiveness and efficiency of city transport through LLGA. I explore these cities further below. A good transport system is critical to the economic development of cities. Transport accounts for high levels of CO2 emissions, with urban transport accounting for 8.5% of EU27 emissions, and transportation accounting for 23% of all emissions globally (International Energy Agency 2008). Mayors recognize the importance and potential impact of transport and have demonstrated their capacity to enact change in the sector. Of the C40 cities surveyed, transportation was one of the areas in which Mayors had the greatest powers and ability to implement new solutions. It is also the sector supporting the largest number of climate change interventions, with C40 cities implementing 919 actions in the transport sector (See C40 baseline report). Transportation is one of the most accessible sectors in which to deliver integrated ‘future city’ solutions. The Agile Cities survey of 50 global cities, showed transportation as the area in which most ‘smart’ interventions had occurred, and transportation was the primary focus of most cross-departmental projects and integrated solutions. Maringá, Brazil, is looking for alternative metropolitan transport solutions to equip the city for continued, sustainable growth. As a metropolitan region of 700,000 inhabitants, the city is looking for comfortable and attractive alternative solutions to public transport and local mass metropolitan and regional transportation, to become an increasingly sustainable and expanding region. The City of Aalborg, Denmark seeks solutions to getting the right information to the right people at the right time through media, to avoid traffic congestion when the Limfjord crossings are blocked. The City of Aalborg is the fourth largest city in Denmark, with a population of 130,000. The Limfjord splits the city in two, with the major part being on the southern side. The tunnel and the road bridge carry approximately 100,000 cars, 35,000 on the bridge and 65,000 through the tunnel, every day. However, incidents in and around the tunnel and bridge can cause unexpected infrastructure collapse and delays, while routine maintenance is also necessary at times. Aalborg’s challenge is to filter and deliver the available data in an innovative way directly to road users, so they can change their plans in the event of road blockage. Finally Boston, USA, is looking for ways of sustaining street utility castings in a bike- and car-friendly way, in order to reduce the bumpiness of roads and hence improve their usability for cyclists and other road users. Data collected from 60,000 trips on Boston’s Street Bump app tells us that Boston’s road bumpiness is primarily driven by metal castings that are no longer flush with the road. Boston is therefore looking for new designs for castings that, at a low cost, can better withstand the pressures of heavy traffic and tough winters. They are also looking for designs or technologies that can make the road smooth again, while minimizing destruction of the surrounding asphalt surface. Barcelona, Spain: BitCarrier’s CitySolver showcase was announced winner of the Barcelona category at the living labs global award 2011. CitySolver’s visualization platform allows the clients to get real time traffic information on different routes defined. Information regarding travel times, average speeds, and traffic volume is delivered to users and managers directly; sensors can be installed on existing urban furniture and do not require street closures or other expensive roadwork. Since the announcement, Bitcarrier worked with the Urban Lab team of 22@ Barcelona to plan the implementation of a pilot as part of a larger consortium. Winning the Living Labs Global Award was critical to gain visibility and build trust with Barcelona’s city officials, creating the reference that CitySolver is indeed a new, viable and efficient solution for managing and controlling urban traffic. Seven months after selecting CitySolver, the City invested into a larger deployment of the traffic sensor system based on the successful pilot. Lavasa, India: Skybus, is the smart “à la carte” microbus service that takes passengers where they want at the time they want, sharing the trip with other passengers with similar trips. The skybus SaaS platform manages web and mobile trip requests, allocates them to vehicles and adapts routes in real-time, taking passengers to destinations in the fastest possible way. Personalized, convenient and low-cost, skybus is the sustainable alternative to private car for commuting, especially suited for those who live and work in peripheric areas, or as a smart complement to expanding the reach of existing public transport networks. From San Francisco to Santiago de Chile, LLGA is also bringing SFpark to South America. SFpark is the first comprehensive demonstration of a parking-based approach to congestion management to reduce traffic congestion and transportation-related greenhouse gas emissions. SFpark uses innovative technology to generate real-time parking space availability information and conduct demand-responsive pricing. SFpark also adjusts rates based on demand to find the lowest hourly rate possible to achieve the right level of parking availability to make parking easier, and to incentivize alternative use of public transport at peak times. Tomorrow I will be blogging about economic development, for the final installment of the LLGA success stories blog series. Read my other blog posts that focus on economic development, energy efficiency and information products. Originally posted on January 29, 2013 by Clare Saxon on Agile Cities website. LLGA has a history of information product challenges. Inspiring examples include San Francisco, Barcelona, Londonderry, Rio de Janeiro and Sant Cugat, all of which have found and are piloting smart data solutions through LLGA, as will be explored later. Information products are central to promoting carbon reduction, as highlighted in our Information Marketplaces report. They are also a key element of the ‘package’ of ICT services enabled services that are forecast to enable 15% emissions savings by 2020, as outlined in our SMART 2020 report. For example, applications, monitoring and big data services that enable behavioral change or optimization of city and citizen processes. It is a large market: access to public data in the EU is forecast to be worth Euro 27 billion. The information product market is also a huge growth area. The use of pen APIs to support data driven city services has grown 400% since 2005. 5 billion people have mobile phones and 50% of web connections are mobile making data products for citizens one of the most accessible and widely available services for citizens to utilize to support a low carbon lifestyle. This year there are two major challenges in LLGA with a focus on information products. Firstly London, UK, which is looking got an energy and greenhouse gas measurement solution to reduce energy consumption and CO2 emissions. Secondly, San Francisco, USA, is seeking a storm response coordination tool to triage storm-related services calls and dispatch crews. The methodology employed by LLGA makes it a unique ‘call for solutions’ program. Rather than simply publishing the challenges it also tasks its multi-lingual in-house research team to explore potential niche solutions and coalitions of existing service providers. I spoke with Abraham Jimenez, LLGA Researcher, who is currently looking into energy and greenhouse gas measurement tools for London, to find out a bit more about the solutions on offer and new ideas the city would like to see. He said: “London is looking to create a dynamic way of measuring the energy that is used in the city and the CO2 that is created, as their only source of info at the moment is via central Government which takes up to a year to reach them. There are lots of solutions that monitor the grid, but companies are focusing either on solutions for domestic or on management platforms for large systems. One company targeting the domestic market is Nest.com, that allows monitoring and control of your thermostat via your iPhone, or utilities.simpleenergy.com/, a smart metering rewards system via social media or commercial consumers that allows them to monitor and optimize usage (including wireless, and reward based products). This is currently seen mainly in the US where there is greater competition over the network. The other categories are products which are are aimed at large scale distributors and consumers of energy, mainly software products. “But there is a gap between these two product categories, and a solution will probably require a consortium of smart metering building scale, sending information to an area hotspot, then to a city central hotspot, then on to the utilities. One of which that is now developing software to utilize this data is power.com/. There are many LLGA Pilots, both in progress as well as completed. A number of success stories have resulted from this global program. San Francisco, USA, is an example of a success story to come out of LLGA. Socrata, then a 12-person software start-up in Seattle with about 15 customers, was fortunate partner with one the world’s most innovative cities to deliver an early roll-out of its cloud-based open data system. After San Francisco issued a call for solutions through the first edition of LLGA in 2010, it saw procurement completed within just nine months of winning the call, accelerating the spread of their Open Data Cloud Solution to 50 leading public sector organizations around the world as a result. Three cities that are also leading the way are Barcelona, Spain; Londonderry, UK; and Rio de Janeiro, Brazil. Connecthings, which was the chosen winner for all three cities in the LLGA2012 edition, is a real-time information and contextual services on transport, cultural heritage, tourism and day-to-day life through NFC, QR codes and SMS, offering inexpensive smart data tools which help reduce paper use, provide audio guides, mapping and e-ticketing functions and above all, is also highly scaleable. Another success story is in the city of Sant Cugat in Spain. Mindmixer is a web-based town hall which empowers citizens to engage, inform and collaborate with government officials anytime and any place. It was attractive as a solution due to its low annual service costs (around US $12,000), and the fact that it maximizes input from citizens regardless of time or location. It also has the potential to build valuable social capital. So that’s my insight on role of information products in the development of smarter cities. Be sure to return next week, when for part 3 and 4 of the sustainable innovation in cities blog series, I will be exploring the role of economic development, energy efficiency and mobility in supporting cities that are at the forefront of the clean revolution. LLGA has a history of solving energy and resource challenges. As you’ll see in a moment, great examples include San Francisco and Barcelona, two cities that both found — and are piloting — solutions to improve resource efficiency through LLGA. Improving energy and resource efficiency are key to promoting low carbon development trajectories. Energy and resource efficiency are also critically linked with economic development and resilience, due to ever rising energy and resource prices, as well as the fact a large proportion of the world’s cities are located in areas with low water availability — or in countries that are hugely reliant on energy imports, such as India. In this year’s LLGA there are four major challenges which focus on energy and resource efficiency. Just click the links below to read more about each city challenge. Firstly there’s Rosario, Argentina, which is seeking to expand its Green Homes Network, both as an educational and an impact monitoring program. The second city challenge belongs to Paris, France, looking to make outside seating more resilient by finding a solution to the excessive energy currently used to heat exterior social spaces – a problem common to many northern cities. Next is Sheffield, UK, a city that is searching for solutions to capturing and distributing industrial heat. And finally is Christchurch, New Zealand, which is pursuing transformational lighting systems that can support spatial and social development of its city spaces, in the aftermath of 2011’s devastating earthquake. LLGA is a unique challenge program, as rather than simply publishing the challenge, it also tasks its multilingual in-house research team to explore potential solutions for challenges via niche methods, or coalitions of existing services. I’ve taken the time to speak with Ana Paola López, currently researching solutions for Rosario, Argentina, which is looking for ways to involve more households in their Green Homes Network initiative and to monitor its environmental impact. She said: “Rosario currently conducts evaluations by asking ‘Leader’ families to monitor things such as the volumes of waste they produce, but this is hard work for the families and it is unlikely this will work if scaled further. The main benefits for cities participating in an open procurement process like this are demonstrated clearly by the successful LLGA pilots that are in progress, or those that are already completed. One of these is San Francisco, an innovative city that developed intelligent lighting systems for implementing remotely managed street lights. Paradox Engineering, the small European company that implemented the pilot, have since had the opportunity to build working relationships with larger smart city players too. Be sure to return tomorrow, when for part 2 of the sustainable innovation in cities blog series, I will be exploring the role of information products in supporting cities that are at the forefront of the clean revolution. Why should cities share their solutions? With participation, open source and shared practice the buzz words of city governance as we kick off 2013,LLGA offers cities the perfect opportunity to share what they’ve been doing with their global peers. Whilst municipalities have a duty to explain how they’ve been spending public funds and what the results are, this opportunity goes much further. By showcasing their newly developed technology or innovative approaches on Citymart, cities are capitalising on their hard work. The result can not only be international recognition and shared continued development but even a new revenue model. Problem solving crosses cultures and national boundaries comfortably. The City of York in the UK submitted their GeniUs community innovation platform for LLGA2012 and were selected as winners by Cape Town, with whom they are currently formulating a pilot. Similarly when Sant Cugat presented their Local Innovation Plan for LLGA2010 they were selected as the winner by the jury for the City of Eindhoven in the Netherlands. Since then, Sant Cugat have provided training and helped Eindhoven to adopt the formula of citizen and business leader engagement in defining its own local innovation plan. Traditionally there are various reasons why cities develop their own technology. While at times they cannot find what they are looking for on the market, at others they simply feel they can do it better or seek the independence of proprietary solutions. In recent years, however, cities have begun developing with the express intention of sharing their technology with other cities. In the US in particular this has led to numerous forums for sharing reusable technology and methods of working, such as the many solutions like SF Park presented by cities on our own Citymart.com or Code for America’s platform for sharing software on Civic Commons. By sharing their creative thinking, cities benefit from a wider user base so that the technology is improved and developed quicker than if they were working on their own. The City of Stockholm and Astando have taken this approach with E-adept, an enabling-technology for visually impaired citizens that is actively marketed to other cities with the objective of sharing further development resources. Other cities that use the technology then advance it and provide feedback to Stockholm in a mutually beneficial relationship. Similarly, Boston has offered several apps including Street Bump for other cities to help build on and make development more efficient. More recently cities have started developing technology with the express intention of licensing or selling it to create revenue and help offset the significant sums invested in development. With their document management platform SmartPDF, San Francisco have done just this with the objective of licensing the technology to other cities and organizations. Whether looking for international exposure, wishing to publically recognise the work of their employees, aiming to share practice and further develop their technology or planning to raise revenue for the city, sharing approaches and technology will be an increasingly popular way for cash-strapped cities to improve services and lower costs in 2013. Do let us know your favourtie resources or forums where cities are sharing their technologies and any additional cases of sharing. LLGA2013 | Cities Pilot the Future. A global call for solutions to improve the lives of millions. Submit by 31.1.13. For Citymart.com and our many partners, this is an important step towards building a global infrastructure that allows high-impact solutions for cities to scale quickly. Why? Because it delivers unprecedented transparency and accountability. This summer, we carried out a survey of 54 global cities under the Agile Cities initiative which showed that 87% of cities do not trust the information supplied by providers. Too often, cities reported, companies submit project references that over-state achievements or give no credit to project partners. 66% of cities, consequently, reported that they rely on informal contacts into the business community and often patchy follow-up on project references through calls to former customers. This is often not documented, and can lead to an overrepresentation of local companies winning contracts. Yet, companies like Connecthings have proven they have technologies worthy of scaling globally. 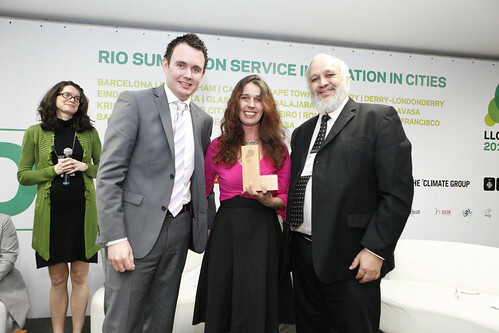 As winners of 4 LLGA|Cities Pilot the Future Awards in 2012, Connecthings was selected to pilot their solution in Rio, Derry~Londonderry, Hamburg and Barcelona. The team at Citymart.com searched for providers that could certify project references to address this trust issue. Nothing could be found. So we looked at ways to build trust online, inspired by the practices used by journalists in the Arab spring to triangulate facts using Twitter and other sources. The result is our Project Validation service, which allows companies to describe projects involving the product/service featured in their Citymart.com Showcase and invite stakeholders (such as customers, users, partners and experts) to validate the basic project facts. Trust starts with the basics. Did the project really happen, or is it under discussion? Was it a full implementation or a pilot? Who was involved? When did it happen? These are binary facts - either true or false. Our validation model works by establishing these facts and requiring three independent stakeholders (who have declared commercial independence from the project) to confirm such facts. Cities are always going to carry out due-diligence when awarding a contract worth millions. Yet, our primary aim with this new Project Validation service is to help cities manage the perceived risks associated with contracting small providers and using new approaches to solve their challenges. If cities cannot trust project references, they have no way of evaluating what is state-of-the art in the market. How can you believe that a technology is mature if you cannot trust its past implementations? The same is true when cities attempt to establish the viability of new and different approaches, which is an issue that most companies consider the most significant barrier to market-entry. Whether your solution tags urban spaces, prevents breast cancer by making use of the sensory skills of blind women, or involves citizens in logistical tasks - cities rely on getting an accurate picture of project implementation history. Trust in an unconsolidated marketplace. We have often written about the challenge of a marketplace with 557,000 local governments dealing with complex technological, service and regulatory decisions. Our vision was to create a trust-building Project Validation service that was scalable in such a marketplace because, unlike other markets, cities are never going to merge and consolidate. This means that there is limited room for the specialized decision-making found in other industries. Hence, our eyes turned to sourcing validations though project stakeholders as the only viable method for validating basic project facts. And this is just the start. Validated references are not just useful in the context of Citymart.com, but in all business activities (tenders, pre-qualifications, RFIs and corporate alliance building) in which increased trust can get you more attention from cities and create better business opportunities. Veronica Bluguermann has recently joined Citymart.com as an Early Stage Researcher under DESMA program, an Initial Training Network in the area of Design Management funded by the European Commission’s Marie Curie Actions. Veronica’s work will be focused on research and service development for engaging citizens in the procurement process through Citymart.com platform. What does Citizen Engagement mean? The process of citizen engagement has been defined as the “ability and incentive for ordinary people to come together, deliberate, and take action on problems or issues that they themselves have defined as important” . Citizen participation is often used for gaining information, assistance and support from citizens, but does not necessarily stress citizen engagement . Research has shown that effective citizen engagement can foster a sense of community, engender trust, enhance creative problem solving, and even increase the likelihood that citizens will support financial investments in community projects. In any of their interactions with citizens, local governments should look for the opportunity to encourage engagement rather than simply seeking an exchange of information . Citizen engagement is a growing area of research and action. In recent years many online platforms have emerged with the aim of bridging city planners with citizens. These platforms allow collaboration in diverse degrees. Citymart.com, through “call for solutions” service, helps cities define their needs, publish them to the marketplace and discover the available solutions. This is one of Citymart.com services that offer great possibilities to involve citizens, for instance, in helping to find the best solution in the market. Cities delegate tasks to citizens: These platforms allow citizens to contribute to specific tasks to solve their own problems or other citizens' problems. The tasks are either delivered by the city planners or organized by a community. Example: ‘Investigate Your MP’ invited citizens to analyze expense reports submitted by MPs, and to fl ag those that deserve closer scrutiny. ‘FixMyStreet’ is an application that allows citizens to report street related problems on a publicly visible map. Companies offering services to the city: Platforms that allow companies to promote their products and services for decision makers. Example: Citymart.com is a global marketplace that connect cities with solutions providers. $300 million in 2011. The study by massolution™ also reveals that the number of workers participating in crowdsourcing projects is rising at over 100% a year. However, when it comes to city development, it is still unclear the impact of these platforms. At the same time, the research in the matter is scant. “Creating a website is not terribly difficult. But creating a project that actually has an impact on communities? That’s really hard. From my experience, the website is a great way to gain attention and motivation and traction, but to actually make real change happen, it’s people.” Jake Barton,founder and principal of Local Projects. Involving millions of citizens from 557.000 local governments with diverse problems is major challenge. To approach this scale, this research will first, build case studies framed by a locality and challenge to be solved. For example, a case study could be based on designing services for prevention of diabetes in the city of Copenhagen or Urban Prototyping and Piloting in San Francisco. It is expected that the case study will provide understanding on the issue of citizen engagement and will help to scale up the solutions: services that can be used for any city with any challenge to be solved. Facebook is one example that shows how is possible to scale up a service. The platform, when it was first developed, intended to serve only in the university campus. Today, it used by hundreds of million users around the world. In the initial phases of the service development process, the methods are aimed to unveil the stakeholder’s needs and wants. While in the latter phases, Participatory Design methods will help stakeholders to contribute in the creation of solutions. Each of the case studies will follow this service loop while the methods will vary according to the need. As a result, Citymart.com service and tools for engaging citizens will emerge from the case studies learning. Gibson, Cynthia M., 2006. Citizens at the Center: A New Approach to Civic Engagement. The Case Foundation. Lukensmeyer, Carolyn J. and Lars Hasselblad Torres, 2006. Public Deliberation: A Manager’s Guide to Citizen Engagement. IBM Center for the Business of Government. Svara, J. H., & Denhardt, J. (2010). White Paper The Connected Community : Local Governments as Partners in Citizen Engagement and Community Building. Creativity, 125. Service Design in the Age of Collaboration. Veronica Bluguermann. MA thesis. Today Citymart.com, the global marketplace for cities connecting more than 50 global cities with more than 1,000 providers of solutions to improve lives announces a landmark partnership with the UN Global Compact Cities Programme. As part of the agreement, Citymart.com has implemented the Cities Programme's 4 dimensions of sustainability used by cities such as Melbourne or São Paulo to carry out their sustainability assessments. The UN Global Compact Cities Programme is dedicated to the promotion and adoption of the Global Compact’s ten principles by cities, and provides a framework for translating the principles into day-to-day urban governance and management. Already today, this model has been implemented in the Citymart.com Showcase as well as in the evaluation model used by the experts appointed in the jury process of LLGA|Cities Pilot the Future, underwritten by 21 global cities such as Barcelona, London, Paris, Mexico City, Lavasa, Lagos and Cape Town. Citymart.com thereby provides solution providers guidance in reporting the impact of technologies and other innovations in line with the objectives identified in the UN Global Compact process. The City Walking project has won the Living Labs Global Award 2012 for the category of Terrassa. The City Council has awarded the two teachers from Universitat Politecnica de Catalunya (UPC) Jaume Figueras and Toni Guasch, responsible for the initiative, a certificate of recognition for having achieved this award. City Walking promotes sport as a way to prevent cardiovascular diseases. The device, designed by UPC Barcelonatech, suggests city routes to users via de use of webpage and a Smartphone. Every suggested route will be different and will allow the user to get to know the heritage and cultural activities of their city and will also offer rewards such as discounts at various local shops. An important feature is that the device can allow doctors to monitor patients’ physical activity. The council, the Health Consortium, the University Hospital Mútua and UPC have signed an agreement to develop a pilot in the city. Work on the implementation of the project will take place over a 6 months period. Potential participants in the pilot will be sought among patients from two health centres, the Mútua and the Consortium. Routes, activities and incentives will be prepared in advanced and in the following 6 months the results will be evaluated to see how the health of people who have participated in the walks has improved. The Lagos State Government, Nigeria - through the INNOVATE LAGOS project and Nollywood Workshops proudly announce the launch of the Nollywood Upgrade Project (Nollywood UP). Nollywood UP is an initiative to support sustainable growth in the Nigerian Film Industry through training, capacity building and innovation in film financing and distribution. Through Nollywood UP, the Nigerian Film Industry will have access to cutting-edge training and compelling film grants. The initiative seeks to pave the way for continued investment and innovation in Nollywood, including the development of community movie cinemas throughout Lagos State. Nollywood Workshops is a non-profit organizationbased in Cambridge, MA and Lagos, Nigeria with the mission of empowering independent filmmaking through training, collaboration and innovation. Since 2005, the Nollywood Workshops team has collaborated in Nigeria on a wide range of trainings and film productions, including the award winning feature length documentary, This Is Nollywood. Nollywood Workshops was co-founded by filmmakers Bond Emeruwa, Aimee Corrigan, Robert Caputo and Franco Sacchi. The team is committed to leveraging the power of film in emerging economies. In 2009, Nollywood surpassed Hollywood, trailing close behind India's Bollywood as the world's second largest producer of feature films. Despite Nollywood’s enormous success on the global scale, piracy threatens to overcome the Nigerian film industry. Estimates suggest that up to 80% of Nollywood’s profits are being lost to piracy. As a commitment towards supporting and developing innovation in Lagos, in May 2011, the Lagos State Government partnered with Living Labs Global 2011 to explore an innovative solution to digital piracy in Nollywood. After an extensive review of various solutions, Nollywood Workshops was invited to Lagos for consultations with the Lagos State Government, Lagos Innovation Advisory Council and local stakeholders, to develop and present their holistic strategy for the Nollywood Upgrade Project, covering production, financing and distribution. The Nollywood UP initiative is a part of Living Labs Global’s Commitment to Action at the Clinton Global Initiative. "Our intention is to help the Nigerian film industry continue to thrive, despite the challenges of digital piracy. In collaboration with Nollywood Workshops and a diverse team of filmmakers, academics, and local stakeholders, the Nollywood Upgrade Project will ensure that the Nigerian film industry remains a global leader in entertainment." Moji Rhodes, Deputy Chief of Staff, Lagos State Government and Coordinator, INNOVATE LAGOS project. Citymart.com, an organisation geared towards innovation and knowledge-sharing in urban environments, today announced its commitment to implement high impact urban and social technologies in 30 cities around the world. The Commitment to Action, announced at the 2012 Clinton Global Initiative (CGI) Annual Meeting, will help cities directly enhance the quality of life of their citizens by improving the efficiency, accessibility and cost-effectiveness of urban services. Citymart.com works to accelerate the diffusion of proven technologies across cities worldwide by connecting the solutions developed by innovators with the decision makers that procure and regulate technologies in cities. Its goal is to open markets to innovators and supply intelligence for cities so local governments invest less public money to greater societal effect. There are more than 557,000 local governments around the world, and they spend about $4.5 trillion each year to deliver important services to their citizens. Cities often invest in re-inventing technologies already available elsewhere resulting in projects costing 20 times more than needed. Citymart.com helps cities discover innovative solutions to meet their problems and needs through a more transparent marketplace. In the process we help high impact solutions reach citizens at least 3 times faster and help cities save more than 95% on the costs commonly incurred reinventing already existing services and technologies. Citymart.com is working to improve local governments’ accountability in the global marketplace and helping cities put citizens’ needs at the center of procurement processes. Using a standard process cities, before making final investment decisions, articulate their challenges and needs, are connected with globally available solutions, and engage all stakeholders through real-life pilots in their communities. Since 2009, urban and social innovations have been successfully piloted and implemented in cities in Europe, Asia, Africa and the Americas, addressing major societal challenges affecting more than 285 million people. The Commitment to Action presented as part of the CGI Annual Meeting today, is underwritten by global cities such as Rio De Janeiro, Brazil; San Francisco, California; Barcelona, Spain; Lagos, Nigeria; and Lavasa, India. More than a thousand solution providers, including corporate partners such as Oracle Corporation and The Climate Group are committed to co-investing in implementing the most promising solutions. In the past 3 years this process covered 42 cities, 1,519 solutions, and 248 expert jurors supporting the selection process. In times of economic austerity and budget cuts, Living Labs Global helps cities and technology providers accelerate the adoption of new high impact solutions at a fraction of the cost so that local governments can spend less to achieve more. Citymart.com is based in Copenhagen (Denmark) and Barcelona (Spain), working with 80 cities and 1,000 companies and research centers in Europe, Africa, Asia and the Americas with a mission to open the market for service innovation in cities and overcome key technology, organization and trade barriers. The flagship “LLGA|Cities Pilot the Future” program is an annual process over 8 months in which cities present their challenges and provide guidance to the business and technology community on future investment plans and needs. Follow progress on Twitter @LLGACities and Facebook at facebook.com/Citymartcom. Established in 2005 by President Bill Clinton, the Clinton Global Initiative (CGI) convenes global leaders to create and implement innovative solutions to the world’s most pressing challenges. CGI Annual Meetings have brought together more than 150 heads of state, 20 Nobel Prize laureates, and hundreds of leading CEO’s, heads of foundations and NGOs, major philanthropists, and members of the media. To date, CGI members have made more than 2,100 commitments, which are already improving the lives of nearly 400 million people in more than 180 countries. When fully funded and implemented, these commitments will be valued at $69.2 billion. Not every day does an early-stage startup get an opportunity to shine on the world stage. In early 2011, Socrata then a 12-person software startup in Seattle with about 15 customers, was nominated for a Living Labs Global Award in Stockholm, by the City of San Francisco. The Living Labs Global award recognizes innovation in cities, creating a highly visible global forum to reward cities and their technology partners for daring to try bold new approaches to solving problems. A perfect opportunity for a startup. Socrata was fortunate to have partnered with one the world’s most innovative cities. Years before Open Data became mainstream, San Francisco realized that its data was a strategic, but idle asset, with vast untapped potential to increase the city’s service capacity and transform its relationship with residents. San Francisco started opening up and releasing its data years ago. As the initiative gained momentum, however, San Francisco realized that it needed a scalable platform that can support the entire data-to-information continuum, from capture and collection to distribution and consumption, in the most cost-effective way possible. In May 2011, San Francisco and Socrata won the Living Labs Global Award for their innovative plan to migrate the city’s Open Data to a new cloud-based Socrata-powered platform. On March 9th, 2012, Mayor Edwin Lee affirmed City’s ongoing commitment to Open Data through the manifestation of this plan, aptly named data.sfgov.org. The website puts City data online in a way that makes it useful to citizens, businesses, developers and even city employees. Simple, easy-to-use, citizen interfaces that allow non-technical users to interactively explore data, visualize it, and share contextually-relevant information with others, on the site, across the web, and on social networks. San Francisco will continue to be one of the nation’s trailblazers in data as a platform for innovation. Socrata, now boasting over 50 of the world’s top public sector organizations like New York City, the World Bank and the United Nations, has grown by leaps and bounds since then and is now the recognized market leader in Open Data. The people of Socrata will always remember fondly the first award that recognized their work with one of the best cities anywhere in the world! From Paris, here is a great idea to make transit a more appealing option in cities -- make the stop an attraction in itself. The main Paris transit agency, RATP (Régie Autonome des Transports Parisiens), has rolled out a "bus stop of the future" that offers a number of features and services while passengers wait for the bus. In too many cities, the placement of bus stops along the road seems to be an afterthought, with the priority placed on providing a set distance between stops rather than considering the appeal of the stop location or its accessibility. Everyone has probably noticed from time to time a bus stop sign plopped next to a major road, with no sidewalk, bench, shading, or other amenity in sight, and -- to no one's surprise -- equally devoid of people. RATP aims to attract users with a new kind of bus stop that serves as an attractive, multi-purpose public space. Its key function will still of course be to pick up and drop off passengers, but the bus stop of the future will also provide a place to purchase food and drink, access the internet, buy a transit ticket, and look up maps and information on the city, among other things. The pilot stop, located outside the Gare de Lyon, also includes a bike share station to better connect transit users to the surrounding city. RATP's bus station design provides an example of how transit agencies can think about their systems and how they can better integrate their services with the surrounding environment. Rather than simply affixing a sign to a slab of concrete, bus stops can and should be designed as something more. Integrating other services at transit stops can increase their use by recognizing and catering to the appeal of better accessibility, convenience, and functionality. Studies have shown that people view their time spent waiting for transit much more negatively than time spent traveling on transit itself. Making that wait less burdensome with other amenities could attract more people to the option of public transit. You can view more photos of the stop here. 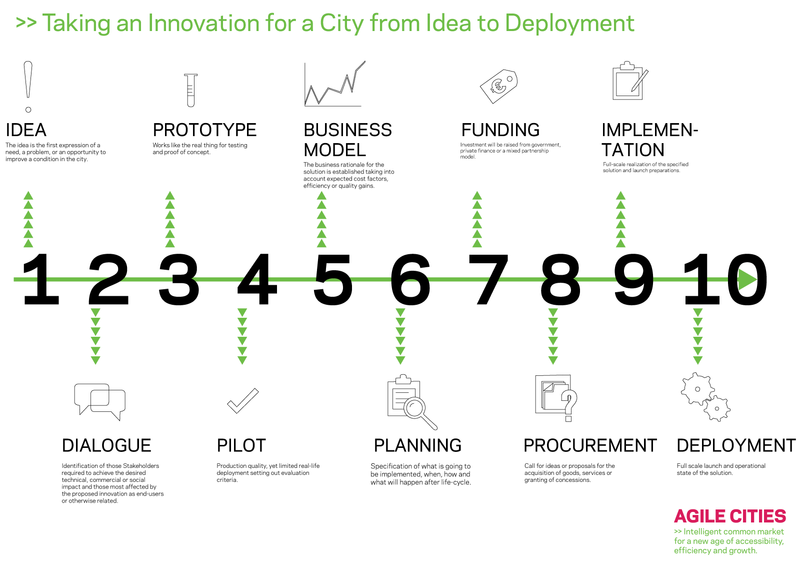 After a first round of consultation of experts and city professionals, Agile Cities is launching the first draft of its 10 stage process to take innovative ideas to full implementation in cities. You can comment on the 10 Steps and the Draft text here. One of the objectives of the Agile Cities initiative is to provide more reliable communication in the marketplace around innovative solutions that can transform communities. A key element of this is to begin to establish a process to track the stages which a typical innovation passes through from Idea to Deployment. After an initial consultation process, we have edited a 10 Step Process which is now open for comment in an iterated editorial process. You can add ideas by going directly to the open text document here or by commenting on this post. Agile Cities Launches Global Survey of Cities on Transparent Markets for City Innovation. [youtube http://www.youtube.com/watch?v=--HWis8NZBI]One of the most notoriously polluted cities in the U.S., Los Angeles is no stranger to smog. A brown haze can be seen hovering over the city many days of the year. In a region with such a temperate climate, LA's poor air quality is more the result of transportation emissions - freight trucks in particular - than building energy consumption. Now the possibility of an electric freight trucking system is being investigated to help curb LA's pollution. The idea was presented last month at the Electric Vehicle Symposium as the Siemens eHighway. The system consists of electric wires suspended above a designated highway lane, which would help to propel hybrid diesel trucks down the road. Along the proposed stretch of highway, a truck would be able to enter the lane and attach to the electric cable, switch off its diesel engine, and run on an electric motor. The trucks would have a mechanism known as a pantograph installed, which would automatically engage the cable above, not unlike the device used on the cable cars of yesteryear. The pantograph would be wired to disconnect from the overhead line when the truck driver brakes. A stretch of Interstate 710, also known as Long Beach Freeway, is slated to accommodate the first eHighway in the U.S., and the first real-world use of the eHighway in the world. The 710 currently funnels huge volumes of freight traffic from the ports of LA and Long Beach north to other parts of the city and out to the rest of the country. Together the two ports account for more than 40% of the freight that is shipped to the U.S., making the 710 an ideal place to test out such a project. If successful, the LA eHighway could allow for the conversion of millions of freight truck-miles from diesel to electric each year. The South Coast Air Quality Management District, the air quality control agency for much of LA and the surrounding region, hopes to have the project underway within the next 12 months.